While the new harvest has been completed in China, the last volumes of the previous campaign are still being marketed in the US. Traders are seeing a decline in terms of quality, which is also reflected in the prices. Peru has also closed the organic ginger season. In the Netherlands and Belgium the situation is not better, with sales prices below import prices. In France, the price for organic ginger is rising, and in Germany, where traders are satisfied with the season, the mood is more optimistic. The ginger harvest was completed last month. The production was disappointing, because the extreme weather in August caused a lot of damage to the crop. In most areas, the production was just as big as last year, since they had expanded the acreage. The export volume has therefore also dropped, because the quality of high quality ginger has been affected, making it unsuitable for export. The price of ginger remains stable for now and did not go as far up as those of apples or pears; however, most Chinese export companies think that the price will fluctuate considerably in the coming months and that the export price will increase. On the international market, Chinese ginger must compete with Brazilian, Thai and Chilean ginger. The Chilean is also organic and is doing very well on the market. The export of Peruvian ginger is on the rise. The figures for 2017 show that the country exported 100% more than in the previous year; that is, 25,205 tons (48 million dollars FOB), compared to 13,731 tons (23.1 million dollars FOB). In 2017, the Netherlands and the US were the most important destinations for the ginger. These were followed by smaller buyers, such as Canada, Belgium and Italy. The ginger market in the US is currently in a transitional stage between two seasons. The last Chinese ginger is being traded, but the quality is not too good, says a trader. That is reflected in the prices. "Chinese ginger is cheap, with a price oscillating between 16 and 20 dollars." Although China ships ginger all year round, the last batches of the 2017 harvest are currently being sold. The new crop is expected from December. "The old harvest they are currently exporting has some quality problems and the prices are extremely low. Some traders have seen their prices drop to $ 14. Last year around this time, the price was a lot higher," says a trader. The season for Peruvian organic ginger is also coming to an end. The prices have been low, but they are rising again. The Latin American country will be on the market again from January. In the meantime, Thailand will take over the organic ginger market. "They have a niche market, because Peru has no volume to export." The demand for organic ginger remains strong, although the price gap between organic and conventional is still too great. "Not everyone is willing to pay 40 to 50 dollars for organic ginger if the conventional costs 20 dollars." The demand oscillates from stable to slightly growing, but the volume on the market is putting prices under pressure. On top of that, the quality is disappointing, as a result of which traders have to repack or refuse product. In the US, there are some specific regions where ginger consumption is clearly higher than in other areas. California has above-average consumption because of the large number of people from Asian descent. New York and Chicago are also big markets. Regardless of the origin of the product, the Italians can be called true ginger consumers. Ginger consumption has risen considerably in recent years according to a company in the north of the country that grows and sells the Italian ginger. This ginger is grown in greenhouses. The crop is planted in March and is harvested between October and December. "Ginger does not need a specific climate. It will grow as long as the temperature stays above 20 degrees Celsius and the soil is fertile," says a trader. This year's first estimates are promising, with 60% more product than in 2017. "Italian ginger stands out when compared to imported ginger," he says. The differences mostly have to do with the shape and size of the product. Italian ginger is mainly sold in the domestic market. The ginger market is currently very slow. It is estimated that there are about 100 containers in stock intended for the Dutch market. The prices for ginger are low. The sales price is currently lower than the import price. When looking at the same period last year, the quality of the ginger is not as good. This is a result of the floods recorded a few months ago in China. The popularity of ginger is growing every year in France, especially among consumers of organic products. These generally have more to spend. "You will not easily come across an organic store in France that does not sell ginger," says a trader at Rungis. "Organic ginger is given a much more important place on store shelves than the conventional variety, because the product fits well with an organic lifestyle." The trader adds that the prices are rising at the moment. This is due to production problems in Peru, which has resulted in somewhat smaller volumes. His own ginger comes from that country. "French consumers are wary of Chinese ginger because it has a bad reputation." In Germany, traders are currently relatively satisfied with the available volumes, particularly from China. Last summer (June-July), there were temporary problems with the product's availability, but this situation improved relatively quickly afterwards. It is also confirmed that a good, stable price can currently be obtained, especially for Chinese goods. 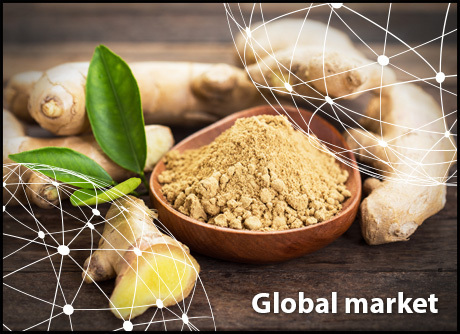 Since the demand for ginger appears to be on the rise, some German importers with their own production are considering the idea of ​​further expanding their existing acreage. A good distance behind, Thailand and Brazil remain the main competitors for the Chinese. Although sales of Thai ginger are growing in the German wholesale market, the Chinese production is still the most popular. It is also worth noting that wholesalers and retailers have different quality requirements. The smaller products (150 gram per piece) are particularly popular within the retail sector, while the larger ones (250 grams per piece) are mainly intended for wholesale trade. Compared to other countries, Australia is not a big ginger producer. According to the trade association, about 8,000 tons of ginger are grown each year. That volume is distributed between the fresh market, which absorbs 60% of the production, and the processing industry, which takes the other 40%. At the moment, the production has a value of 32 million Australian dollars (20 million Euro). The value of the products in which ginger is an important ingredient is estimated at 100 million Australian dollars (63.8 million Euro). Plantations are mostly located in Queensland and the region with the largest production is Buderim, north of Brisbane. Statistics show that Australia is a net importer of fresh ginger. 120 tons were imported in 2017. For comparison, 17 tons were exported. Traditionally, the entire import volume goes to the processing industry.